The village of Épinac is at the northern boundary of the Department of the Saône-et-Loire, some 24 kilometres due west of Beaune. The churchyard is in the centre of the village. On the left of the entrance and left of the main path are three traditional CWGC headstones and one Jewish. The airmen were killed on the 11th September 1944. 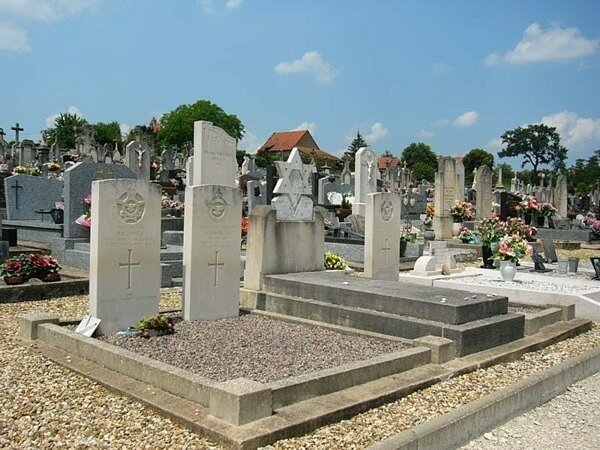 Incident: The aircraft crashed at Mont-de-Lavaut, Aubigny-la-Ronce on 11th Sept. 1944. Sgt. 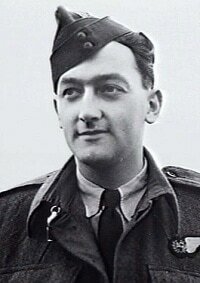 Len Royle was wounded and was evacuated from the burning aircraft by Sgt. Alan Beaty who then hid Royle and went to seek help. Both survived the War. INSCRIPTION. ALWAYS REMEMBERED BY THOSE YOU LOVED. INSCRIPTION. ONE OF GOD'S FINEST GENTLEMEN. 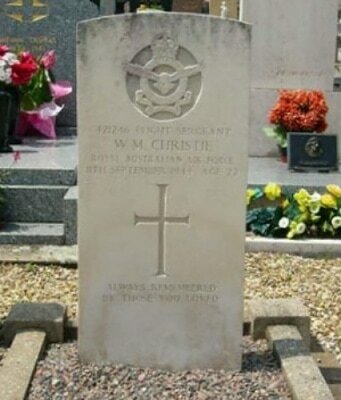 11th September 1944, aged 22. Son of William Morton and Cecelia Alice Christie of Burwood, New South Wales, Australia. ​1487441 Flight Sergeant Alan Laverick, Air Bomber in 298 Squadron, Royal Air Force Voluntary Reserve, died 11th September 1944. 425782 Pilot Officer Owen Keith Smith, Royal Australian Air Force, died 11th September 1944, aged 23. Son of George Oliver Windmill Smith and Lillian Alice Smith; husband of Flora Alexandra Smith of Borrowash, Derbyshire, England. 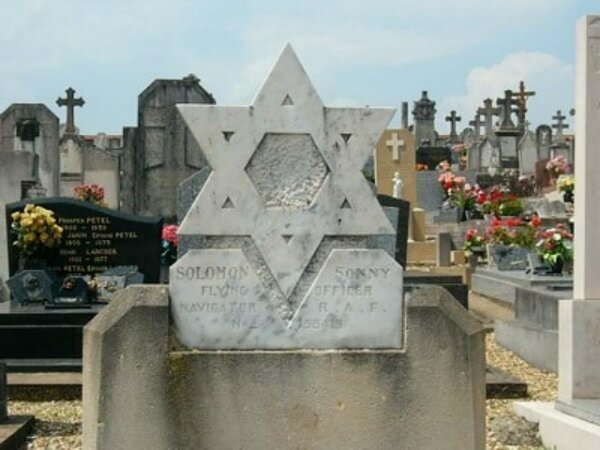 His grave inscription reads "One of God's best gentlemen"
158419 Flying Officer Sonny Solomon, Navigator in 298 Squadron, Royal Air Force Voluntary Reserve, died 11th September 1944.